Air pollution affects everyone. Every day, the average adult breathes over 3,000 gallons of air. Children breathe even more air per pound of body weight and are thus more susceptible to air pollution. Millions of people live in areas where urban smog, very small particles, and toxic pollutants pose serious health concerns. These health concerns can stem from either short-term or long-term exposure to air pollution. When people have a short-term exposure to air pollutants above certain levels, they may experience temporary health concerns, such as eye irritation and burning, throat irritation, and difficulty breathing. Long-term exposure to air pollution can cause chronic health concerns, such as cancer and damage to the body's immune, neurological, reproductive, and respiratory systems. 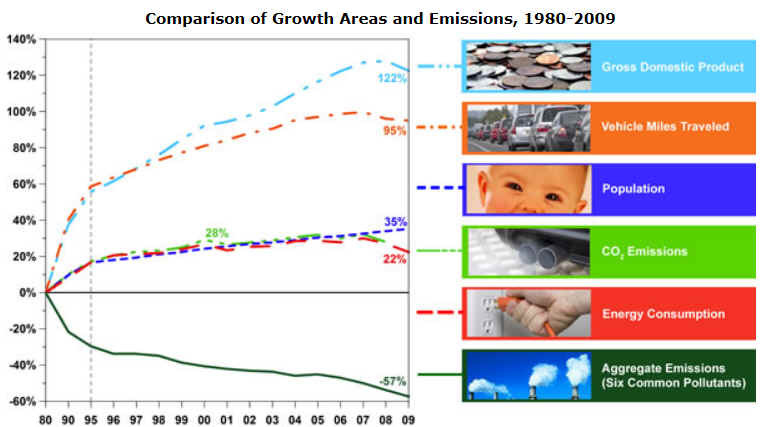 The problem of air pollution is also found outside of major urban centers. Air pollution can be wide-ranging as well as persistent. Many air pollutants, such as those that form urban smog and toxic compounds, remain in the environment for long periods of time. These air pollutants can also be carried hundreds of miles by winds and can thus affect areas far-removed from the source of the pollution. Children are very sensitive to the effects of air pollution. Children's lungs are still developing and polluted air may contribute to permanent lung damage. Children breathe more rapidly than do adults, and inhale more pollution per pound of body weight than adults. Therefore, their lungs have a greater chance for being exposed to harmful air pollutants. The AQI is an index for reporting daily air quality. It tells you how clean or polluted your air is, and what associated health effects might be a concern for you. The AQI focuses on health effects you may experience within a few hours or days after breathing polluted air. EPA calculates the AQI for five major air pollutants regulated by the Clean Air Act: ground-level ozone, particle pollution (also known as particulate matter), carbon monoxide, sulfur dioxide, and nitrogen dioxide. For each of these pollutants, EPA has established national air quality standards to protect public health .Ground-level ozone and airborne particles are the two pollutants that pose the greatest threat to human health in The United States. "Good" AQI is 0 - 50. Air quality is considered satisfactory, and air pollution poses little or no risk. "Moderate" AQI is 51 - 100. Air quality is acceptable; however, for some pollutants there may be a moderate health concern for a very small number of people. For example, people who are unusually sensitive to ozone may experience respiratory symptoms. "Unhealthy for Sensitive Groups" AQI is 101 - 150. Although general public is not likely to be affected at this AQI range, people with lung disease, older adults and children are at a greater risk from exposure to ozone, whereas persons with heart and lung disease, older adults and children are at greater risk from the presence of particles in the air. .
"Unhealthy" AQI is 151 - 200. Everyone may begin to experience some adverse health effects, and members of the sensitive groups may experience more serious effects. .
"Very Unhealthy" AQI is 201 - 300. This would trigger a health alert signifying that everyone may experience more serious health effects. Smog is a kind of air pollution; the word "smog" is a portmanteau ( a word or morpheme that fuses two or more words or word parts to give a combined or loaded meaning) of smoke and fog. "Smog" refers to a noxious mixture of air pollutants that can often be seen as a haze in the air. It often stays for an extended period of time over densely populated cities or urban areas, such as London, New York, Los Angeles, Mexico City, Houston, Toronto, Athens, Beijing andHong Kong. A temperature inversion occurs when air close to the earth is cooler than the air above it. Under these conditions the pollution cannot rise and be dispersed. Cities surrounded by mountains also experience trapping of pollution. Inversion can happen in any season. Winter inversions are likely to cause particulate and cabon monoxide pollution. Summer inversions are more likely to create smog. Smog can make breathing more difficult -- even for healthy people -- and it can make us more susceptible to cardio-respiratory diseases. Even healthy young adults breathe less efficiently on days when the air is heavily polluted, especially if exercising outdoors. Beijing China air on a day after rain (left) and a sunny but smoggy day (right) August 2005. Particularly vulnerable to smog are people with heart or lung disease, the elderly and small children. 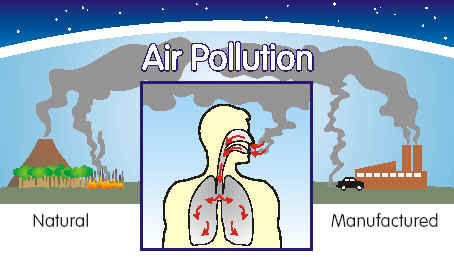 The two main ingredients in smog that affect our health are ground-level ozone and fine airborne particles. Ground-level ozone is a colorless and highly irritating gas that forms just above the earth's surface. It is called a "secondary" pollutant because it is produced when two primary pollutants react in sunlight and stagnant air. 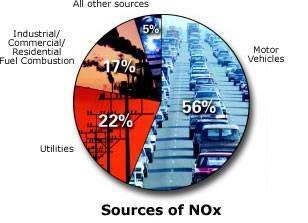 These two primary pollutants are nitrogen oxides (NOx) and volatile organic compounds (VOC). 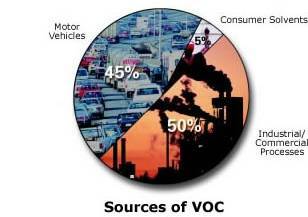 NOx and VOC come from natural sources as well as human activities. NOx are nitrogen-oxygen compounds that include the gases nitric oxide and nitrogen dioxide, and are produced mostly by burning fossil fuels. VOC are carbon-containing gases and vapors such as gasoline fumes (but excluding carbon dioxide, carbon monoxide, methane, and chlorofluorocarbons). Human activities are responsible for the increases in ground-level ozone in recent years. About 95 per cent of nitrogen oxides from human activity come from the burning of coal, gas and oil in motor vehicles, homes, industries and power plants. VOC come mainly from fuel combustion and from the evaporation of liquid fuels and solvents. Ozone not only affects human health, it can damage vegetation and decrease the productivity of some crops. It can also injure flowers and shrubs and may contribute to forest decline in some parts of Canada. Ozone can also damage synthetic materials, cause cracks in rubber, accelerate fading of dyes, and speed deterioration of some paints and coatings. As well, it damages cotton, acetate, nylon, polyester and other textiles. Airborne particles are microscopic and remain suspended in the air for some time. Particles can be both primary pollutants and secondary pollutants, sent directly into the atmosphere in the form of windblown dust and soil, sea salt spray, pollen and spores. Secondary particles are formed through chemical reactions involving nitrogen oxides, sulfur dioxide, VOCs and ammonia. 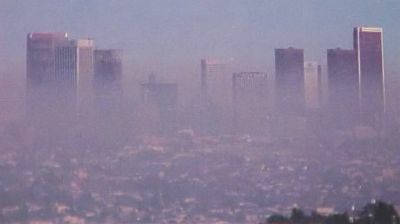 Particles give smog its color and affect visibility. Depending on the type of particles, the air can appear yellowish-brown, or even white. Like ozone, particles are believed to have adverse effects on vegetation, and on various synthetic and natural surfaces. .
Nitrogen Dioxide (NO2 ) is a principal member of the family of nitrogen oxides (NOx ). It is a toxic, irritating gas that results from all combustion processes. Sulphur dioxide (SO2) is a colorless gas that smells like burnt matches. It can be chemically transformed into acidic pollutants such as sulfuric acid and sulfates (sulfates are a major component of fine particles). The main sources of airborne SO2 are coal-fired power generating stations and non-ferrous ore smelters. Sulfur dioxide is also the main cause of acid rain, which can damage crops, forests and whole ecosystems. Carbon Monoxide (CO) is a colorless, odorless and tasteless gas that comes primarily from automobile emissions. "Acid rain" is a broad term referring to a mixture of wet and dry deposition (deposited material) from the atmosphere containing higher than normal amounts of nitric and sulfuric acids. The precursors, or chemical forerunners, of acid rain formation result from both natural sources, such as volcanoes and decaying vegetation, and man-made sources, primarily emissions of sulfur dioxide (SO2) and nitrogen oxides (NOx) resulting from fossil fuel combustion. 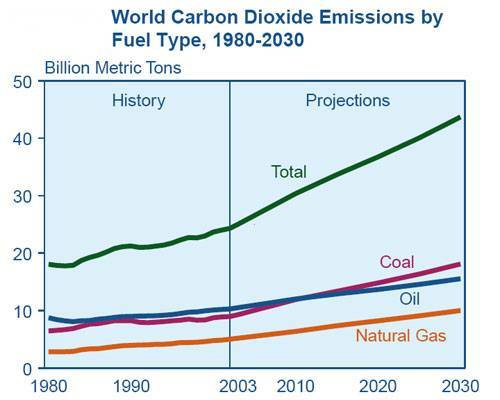 In the United States, roughly 2/3 of all SO2 and 1/4 of all NOx come from electric power generation that relies on burning fossil fuels, like coal. Acid rain occurs when these gases react in the atmosphere with water, oxygen, and other chemicals to form various acidic compounds. The result is a mild solution of sulfuric acid and nitric acid. When sulfur dioxide and nitrogen oxides are released from power plants and other sources, prevailing winds blow these compounds across state and national borders, sometimes over hundreds of miles. Wet deposition refers to acidic rain, fog, and snow. If the acid chemicals in the air are blown into areas where the weather is wet, the acids can fall to the ground in the form of rain, snow, fog, or mist. As this acidic water flows over and through the ground, it affects a variety of plants and animals. The strength of the effects depends on several factors, including how acidic the water is; the chemistry and buffering capacity of the soils involved; and the types of fish, trees, and other living things that rely on the water. In areas where the weather is dry, the acid chemicals may become incorporated into dust or smoke and fall to the ground through dry deposition, sticking to the ground, buildings, homes, cars, and trees. Dry deposited gases and particles can be washed from these surfaces by rainstorms, leading to increased runoff. This runoff water makes the resulting mixture more acidic. About half of the acidity in the atmosphere falls back to earth through dry deposition. 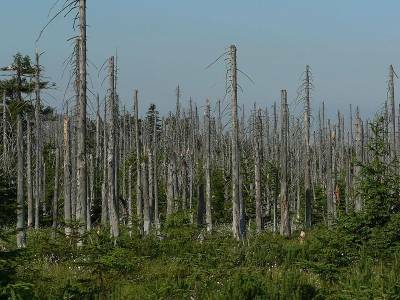 Acid rain causes acidification of lakes and streams and contributes to the damage of trees at high elevations (for example, red spruce trees above 2,000 feet) and many sensitive forest soils. In addition, acid rain accelerates the decay of building materials and paints, including irreplaceable buildings, statues, and sculptures that are part of our nation's cultural heritage. Prior to falling to the earth, sulfur dioxide (SO2) and nitrogen oxide (NOx) gases and their particulate matter derivatives—sulfates and nitrates—contribute to visibility degradation and harm public health. Trees lose some of the protection in their leaves, leaving them more at risk from frost and diseases. Tree roots may also become stunted, so they can't take up as many nutrients. Soils lose some of their nutrients. Increasing acid levels may cause problems for aquatic animals and plants. Some fish may have trouble breathing for example. Acid rain may dissolve the stonework and mortar of buildings causing structural problems of buildings. Acid rain does not usually kill trees directly. Instead, it is more likely to weaken trees by damaging their leaves, limiting the nutrients available to them, or exposing them to toxic substances slowly released from the soil. Quite often, injury or death of trees is a result of these effects of acid rain in combination with one or more additional threats. Scientists know that acidic water dissolves the nutrients and helpful minerals in the soil and then washes them away before trees and other plants can use them to grow. At the same time, acid rain causes the release of substances that are toxic to trees and plants, such as aluminum, into the soil. Scientists believe that this combination of loss of soil nutrients and increase of toxic aluminum may be one way that acid rain harms trees. Such substances also wash away in the runoff and are carried into streams, rivers, and lakes. More of these substances are released from the soil when the rainfall is more acidic. However, trees can be damaged by acid rain even if the soil is well buffered. Forests in high mountain regions often are exposed to greater amounts of acid than other forests because they tend to be surrounded by acidic clouds and fog that are more acidic than rainfall. Scientists believe that when leaves are frequently bathed in this acid fog, essential nutrients in their leaves and needles are stripped away. This loss of nutrients in their foliage makes trees more susceptible to damage by other environmental factors, particularly cold winter weather. Acid rain looks, feels, and tastes just like clean rain. The harm to people from acid rain is not direct. Walking in acid rain, or even swimming in an acid lake, is no more dangerous than walking or swimming in clean water. However, the pollutants that cause acid rain—sulfur dioxide (SO2) and nitrogen oxides (NOx)—do damage human health. These gases interact in the atmosphere to form fine sulfate and nitrate particles that can be transported long distances by winds and inhaled deep into people's lungs. Fine particles can also penetrate indoors. Many scientific studies have identified a relationship between elevated levels of fine particles and increased illness and premature death from heart and lung disorders, such as asthma and bronchitis. Based on health concerns, SO2 and NOx have historically been regulated under the Clean Air Act, including the Acid Rain Program. In the eastern U.S., sulfate aerosols make up about 25 percent of fine particles. By lowering SO2 and NOx emissions from power generation, the Acid Rain Program will reduce the levels of fine sulfate and nitrate particles and so reduce the incidence and the severity of these health problems. When fully implemented by the year 2010, the public health benefits of the Acid Rain Program are estimated to be valued at $50 billion annually, due to decreased mortality, hospital admissions, and emergency room visits. Decreases in NOx emissions are also expected to have a beneficial impact on human health by reducing the nitrogen oxides available to react with volatile organic compounds and form ozone. Ozone impacts on human health include a number of morbidity and mortality risks associated with lung inflammation, including asthma and emphysema. Ozone depletion is another result of pollution. Chemicals released by our activities affect the stratosphere , one of the atmospheric layers surrounding earth. The ozone layer in the stratosphere protects the earth from harmful ultraviolet radiation from the sun. Release of chlorofluorocarbons (CFC's) from aerosol cans, cooling systems and refrigerator equipment removes some of the ozone, causing "holes"; to open up in this layer and allowing the radiation to reach the earth. Ultraviolet radiation is known to cause skin cancer and has damaging effects on plants and wildlife. In The United States the use of SUVS (Suburban Utility Vehicles) is the latest fad and passion. SUVS on average releases 5,600 pounds of CO2 into the atmosphere each year, double the amount of the average car driven the same distance. Air travel has become commonplace for vacationers, but not with out it's unseen costs to the environment. A round trip flight from New York to Los Angeles release as much as one automobile does in an entire year. On a yearly basis all air travel releases 600 million tons of carbon dioxide into the atmosphere. Global air pollution continues to worsen do to the population growth and scant environmental restrictions in many nations. It is becoming increasingly hazardous to the health of The Earth. There are six major outdoor air pollutants- ozone, particulate matter, carbon monoxide, lead, nitrogen dioxide, and sulfur dioxide. NASA's Terra spacecraft has assembled the most complete view ever of the world's air pollution travelling through the atmosphere, across continents and oceans. For the first time, policymakers and scientists now have a way to identify the major sources of air pollution and to closely track where the pollution goes, anywhere on Earth. The false colors in these images represent levels of carbon monoxide in the lower atmosphere, ranging from about 390 parts per billion (dark brown pixels), to 220 parts per billion (red pixels), to 50 parts per billion (blue pixels). Carbon monoxide is a gaseous byproduct from the burning of fossil fuels, in industry and automobiles, as well as burning of forests and grasslands. 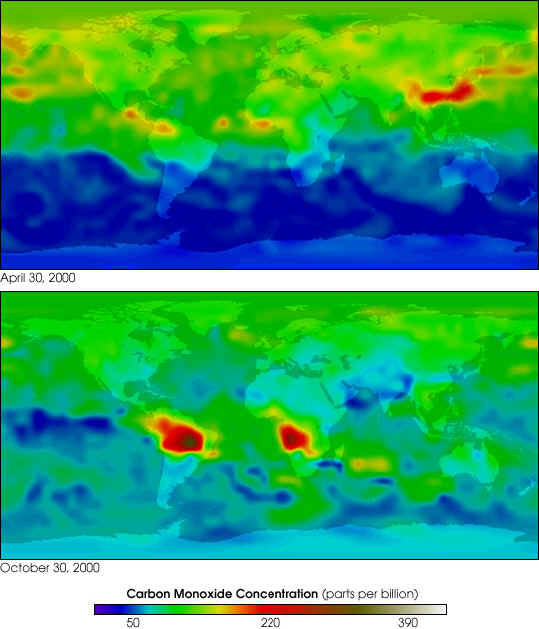 Notice in the April 30, 2000, image that levels of carbon monoxide are much higher in the Northern Hemisphere, where human population and human industry is much greater than in the Southern Hemisphere. However, in the October 30, 2000, image notice the immense plumes of the gas emitted from forest and grassland fires burning in South America and Southern Africa. The levels of pollutants in the air inside homes, schools, and other buildings can be higher than the level of pollutants in the outdoor air. Indoor air pollution comprises a mixture of contaminants penetrating from outdoors and those generated indoors. In the last several years, the amount of scientific evidence has indicated that the air within homes and other buildings can be more seriously polluted than the outdoor air in even the largest and most industrialized cities. Other research indicates that people spend approximately 90 percent of their time indoors. In addition, people who may be exposed to indoor air pollutants for the longest periods of time are often those most susceptible to the effects of indoor pollution. Such groups include the young, the elderly, and the chronically ill, especially those suffering from respiratory or cardiovascular disease. There are many sources of indoor air pollution in homes. 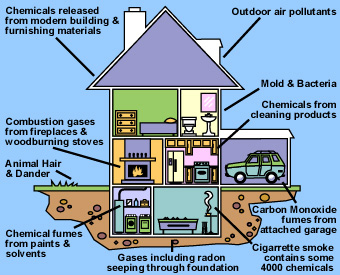 These sources of indoor air pollution include combustion sources (oil, gas, kerosene, coal, wood, tobacco products), building materials, wet or damp carpet, cabinetry or furniture made of certain pressed wood products; household cleaning products, central heating and cooling systems, humidification devices, and outdoor sources such as radon, pesticides, and outdoor air pollution. Radon and environmental tobacco smoke (ETS) are the two indoor air pollutants of greatest concern from a health perspective. Radon is a naturally occurring gas that is odorless, colorless, and radioactive. Environmental tobacco smoke (ETS) is the smoke emitted from the burning of a cigarette, pipe, or cigar, and smoke inhaled by a smoker. It is a complex mix of more than 4,000 chemical compounds, containing many known or suspected carcinogens and toxic agents, including particles, carbon monoxide, and formaldehyde. More than three billion people worldwide continue to depend on solid fuels, including biomass fuels (wood, dung, agricultural residues) and coal, for their energy needs. Cooking and heating with solid fuels on open fires or traditional stoves results in high levels of indoor air pollution. Indoor smoke contains a range of health-damaging pollutants, such as small particles and carbon monoxide, and particulate pollution levels may be 20 times higher than accepted guideline values. Poor indoor air quality can cause or contribute to the development of chronic respiratory diseases such as asthma and hypersensitivity pneumonitis. In addition, it can cause headaches, dry eyes, nasal congestion, nausea and fatigue. People who already have respiratory diseases are at greater risk. Environmental tobacco smoke (ETS) also called "secondhand smoke," a major indoor air pollutant, contains about 4,000 chemicals, including 200 known poisons, such as formaldehyde and carbon monoxide, as well as 43 carcinogens. ETS causes an estimated 3,000 lung cancer deaths and 35,000 to 50,000 heart disease deaths in non-smokers, as well as 150,000 to 300,000 cases of lower respiratory tract infections in children under 18 months of age each year. Formaldehyde is a common chemical, found primarily in adhesive or bonding agents for many materials found in households and offices, including carpets, upholstery, particle board, and plywood paneling. The release of formaldehyde into the air may cause health problems, such as coughing; eye, nose, and throat irritation; skin rashes, headaches, and dizziness. Asbestos is the name given to a group of microscopic mineral fibers that are flexible and durable and will not burn. Asbestos fibers are light and small enough to remain airborne; they can be inhaled into the lungs and can cause asbestosis (scarring of the lung tissue), lung cancer and mesothelioma, a relatively uncommon cancer of the lining of the lung or abdominal cavity. Many asbestos products are found in the home, including roofing and flooring materials, wall and pipe insulation, spackling compounds, cement, coating materials, heating equipment, and acoustic insulation. These products are a potential problem indoors only if the asbestos-containing material is disturbed and becomes airborne, or when it disintegrates with age. Carbon monoxide is an odorless, colorless gas that interferes with the distribution of oxygen to the body. Depending on the amount inhaled, this gas can impede coordination, worsen cardiovascular conditions, and produce fatigue, headache, confusion, nausea, and dizziness. Very high levels can cause death. Nitrogen dioxide is a colorless, odorless gas that irritates the mucous membranes in the eye, nose and throat and causes shortness of breath after exposure to high concentrations. Prolonged exposure to high levels of this gas can damage respiratory tissue and may lead to chronic bronchitis.